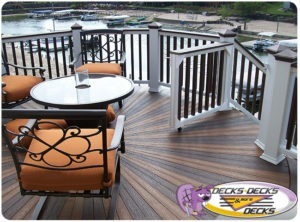 Decks, Decks and More Decks provides low-maintenance custom decks to the Omaha-metro. Low-maintenance decking allows for more enjoyment and less work on the part of homeowners, not to mention there will be no splinters or cracked boards. Building a custom deck, requiring little-to-no maintenance, is an investment in your home, your resources and your valuable time. This spring, while all your neighbors have been busy refinishing their cedar decks and replacing rotting decking – our Omaha custom deck customers can just pull out the furniture for instant enjoyment. And for our low-maintenance custom deck customers who may have experienced issues with their decking after the winter… our low-maintenance decking materials are backed by industry-leading warranties. So, our customers can be confident in the function and beauty of their custom deck for years to come. If this spring you’re longing for a comfortable outdoor space to enjoy, but dread extra work in this busy season of life, call our Omaha custom deck builders and we’ll provide a free estimate! This entry was posted in Custom Decks Omaha and tagged custom decks omaha, deck building omaha, decks omaha on May 18, 2017 by Decks, Decks and More Decks. Our custom deck Omaha team not only designs and builds beautiful outdoor entertaining space, but also enhances that space with accessories and functional shade coverings. The summer sun is hot, and a custom pergola can provide the small bit of shade your family and guests need to enjoy a summer’s day on your custom deck. A pergola is a shade covering with cross rafters and no walls. Pergolas provide protection from the sun, while offering air flow. Adding a pergola maximizes your usable outdoor space by adding an area for outdoor furniture that is somewhat protected from the elements. A pergola creates visual interest, and you can add flowering vines to grow up and over the rafters and down the vertical posts. A pergola can also be decorated by hanging planters or other design elements from the rafters. A clear advantage to a pergola is that you can determine how much sun and shade the pergola provides. Our Omaha deck builders can survey the area taking into account the season, time of day and the angle at which the sun shines to determine how to angle the rafters. By varying the size, spacing and orientation of the rafters, shade is truly customizable. A beautiful outdoor entertaining space for your Omaha home doesn’t have to be JUST a custom deck. At Decks, Decks & More Decks our custom deck experts enjoy taking a custom deck and adding accessories and functional shade to ensure customers get the most out of their custom deck. This entry was posted in Custom Decks Omaha and tagged custom decks omaha, deck building omaha, decks omaha on May 1, 2017 by Decks, Decks and More Decks.